Hardwood Flooring is a beautiful, classic choice for any home. This classic flooring option has evolved greatly to include distressed planks, planks in wider widths, and exotic woods, cork, and bamboo. Solid Wood Flooring: Available in prefinished or unfinished, ¾” thick hardwood floors are the traditional floors that have been used in homes for centuries. Boards come in varying lengths, typically from 2’ to 5’ long to give you the elegant appearance you expect in a wood floor. Solid wood floors can be sanded several times in their life, which explains why homes built in the 19th century often still have their original floors in service. Engineered Wood Flooring: Engineered wood floors are made using layers of wood each turned 90 degrees to the previous layer to give you a strong wood floor that is much more dimensionally stable. A top veneer of hardwood is applied as the wear surface, and many engineered floors have a surface thick enough to be sanded and refinished. Engineered floors are designed to be installed as a “floating floor,” so the boards are attached to each other, but not fastened to the subfloor. Floating floors: are ideal to use over concrete, or in remodeling projects when particle board subflooring is discovered under old carpet. For those who have environmental concerns, engineered floors use less of the premium hardwood typically used in solid wood floors. Prefinished vs. Jobsite Sanding and Finishing: There are so many varieties and stain colors of prefinished floors today that you can almost certainly find one to meet your needs. Prefinished floors typically have between 5 and 8 coats of polyurethane applied, and in many cases have the addition of aluminum oxide to help minimize finish dulling in traffic lanes. The beauty of prefinished flooring is that it minimizes the amount of dust in your home, and it reduces the odor of applying polyurethane on-site. Most prefinished floors have a very slight beveled edge which is why some people choose to go the route of jobsite sanding and finishing to provide flooring that is sanded perfectly smooth. If a particular stain color needs to be achieved, jobsite finishing allows the opportunity to arrive at the perfect color. Refinishing your Wood Floors: The beauty of polyurethane finishes on flooring today is that they can be resurfaced without actually sanding away any wood. Most wood floors can be screened and recoated with polyurethane, which means that the surface is simply scuffed before the new finish is applied. Of course, in the event of severe scratching, they generally can be resanded and finished to bring back their original beauty. 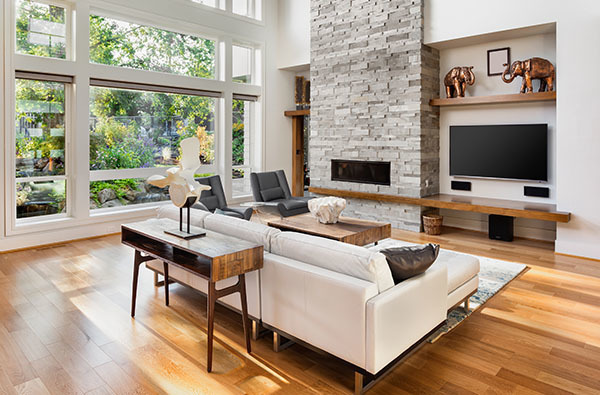 Exotic Hardwood Flooring: Discover the rich, enchanting character of exotic hardwood flooring like Brazilian Cherry, Santos Mahogany, and Amendoim, from BR-111. Brazilian hardwoods offer superior hardness levels and distinctive graining to provide characteristics that are unique to each species. BR-111 is committed to the preservation and renewal of the rain forest, actively promoting sustainable forest practices and securing timber that is selectively harvested and inspected by the Brazilian Institute of the Environment and Natural Resources.